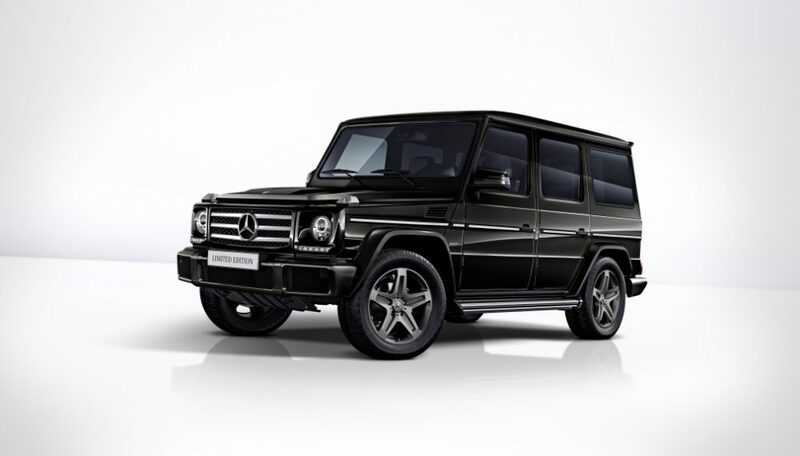 Since 1979 the G-Class has been the Mercedes-Benz SUV icon. Its unique DNA is stronger than time; is unimpressed by short-lived fashion trends it remains true to its roots. This also holds true for the new G-Class. In the international 360-degree campaign for the world premiere and market launch, Mercedes-Benz presents the new G-Class as a ground-breaking legend in off-road performance. Beyond this, the G also shows its on-road strengths and presents its enduring, timeless design. The motto of the campaign is accordingly “Stronger Than Time”. With this campaign, Mercedes-Benz makes it possible for customers and fans to enter the fascinating world of this iconic off-road vehicle and discover why the G-Class has been enthralling people around the globe for almost 40 years. 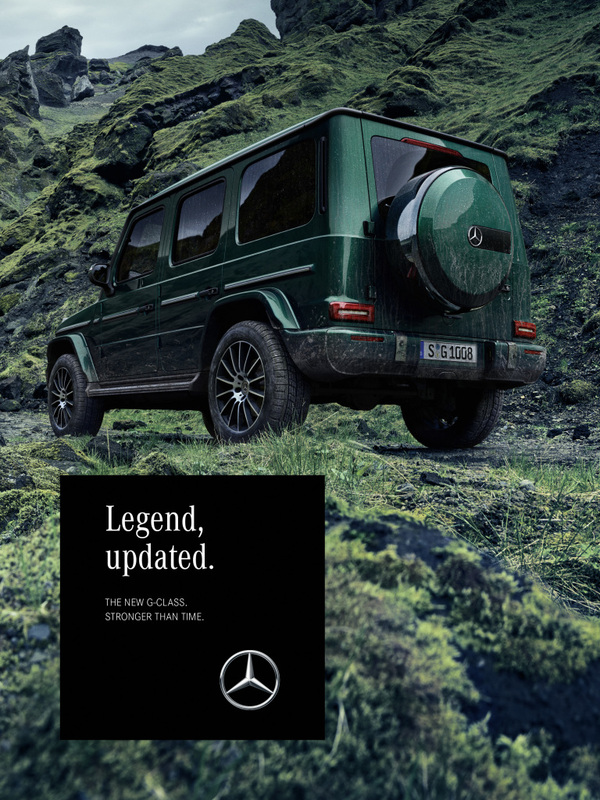 Like the online communication, the print campaign with its different image worlds shows that the G-Class is an icon for more than just one lifeworld. Thus, intense, metallic blue tones embody a modern and cool-puristic urbanity in the motifs of the “Blue Night” world of life. The impressions are enhanced by reflective lights of the evening city in a rainy night. The campaign “Stronger Than Time” shows in a modern way the unmistakable DNA and timelessness of the G-Class. 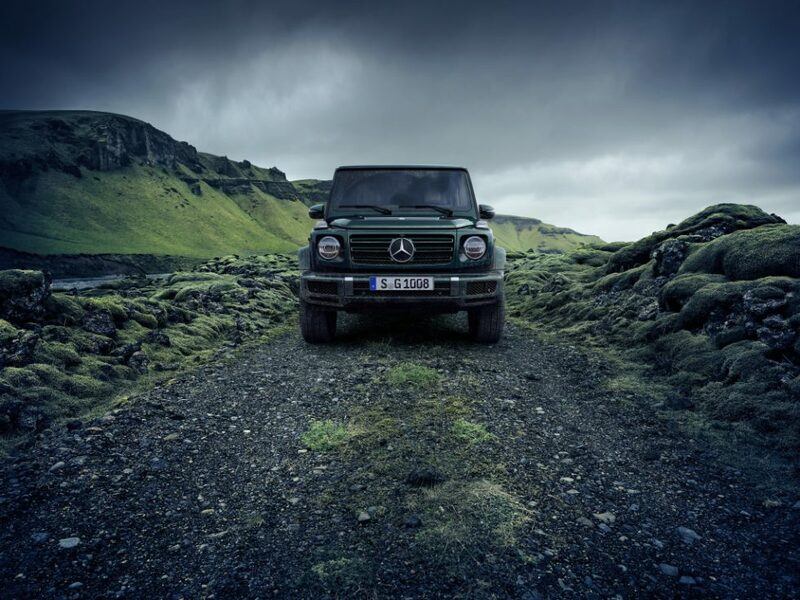 In classic print media, the G-Class will appear with impressive pictures from 15 January 2018. Image worlds of off-road capability, design and on-road performance, and take on natural elements such as rock and lava formations, and water, which are like the G-class “stronger than time”. The tonality of the campaign reflects the character of the off-road legend: strong messages in impressive picture worlds. The global campaign “Stronger Than Time” starts on January 15, 2018 with the eponymous web special at www.mercedes-benz.com. In the field of campaign mechanics, it relies above all on digital media and social networks. “The iconic car is our oldest series and has developed from a pure off-road vehicle to an icon of the postmodern world of life. He is simply stronger than time and stands confidently over every fashion trend “, said Dr. Gunnar Güthenke, Head of Mercedes-Benz Product Division G-Wagon. The global campaign “Stronger Than Time” is accompanied by impressive motifs in the classic media. Impressive pictures and films show the product highlights of the new G-Class online and offline. Image worlds of off-road capability, design and on-road performance, and take on natural elements such as rock and lava formations, and water, which are like the G-class “stronger than time”. In classic print media, the G-Class will appear with impressive picturesfrom 15 January 2018 . Here is an ad motif from the “Green Lava” world. 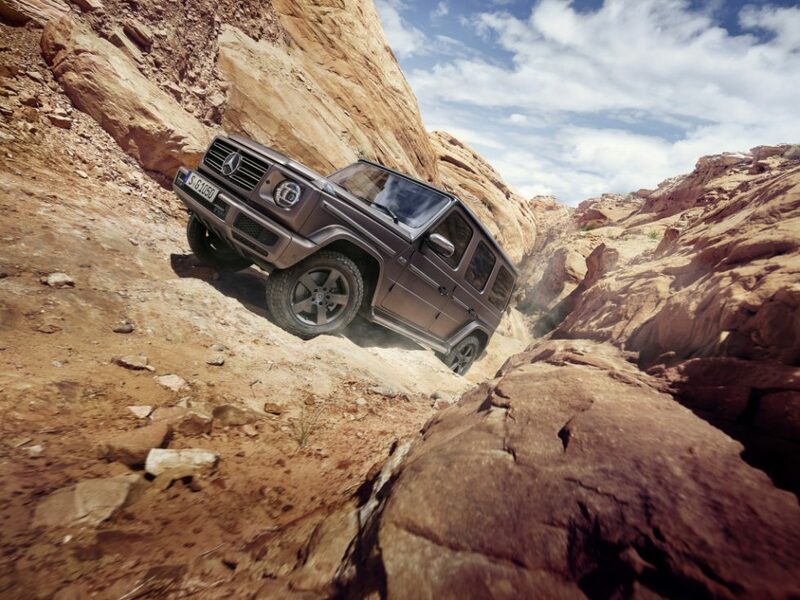 The themes off-road capability, design and on-road performance pick up natural elements, such as rock and lava formations, and water, which, like the G-Class, are “stronger than time”. Here is an ad motif from the “Green Lava” world. With the campaign, Mercedes-Benz is taking customers and fans to the fascinating worlds of the iconic all-terrain vehicle and showing why the G-Class has thrilled people for almost 40 years. Here is an ad motif from the “Amber Rock” lifeworld. The tonality of the campaign reflects the character of the off-road legends: strong messages in impressive visual worlds. Here is an ad motif from the “Amber Rock” world. 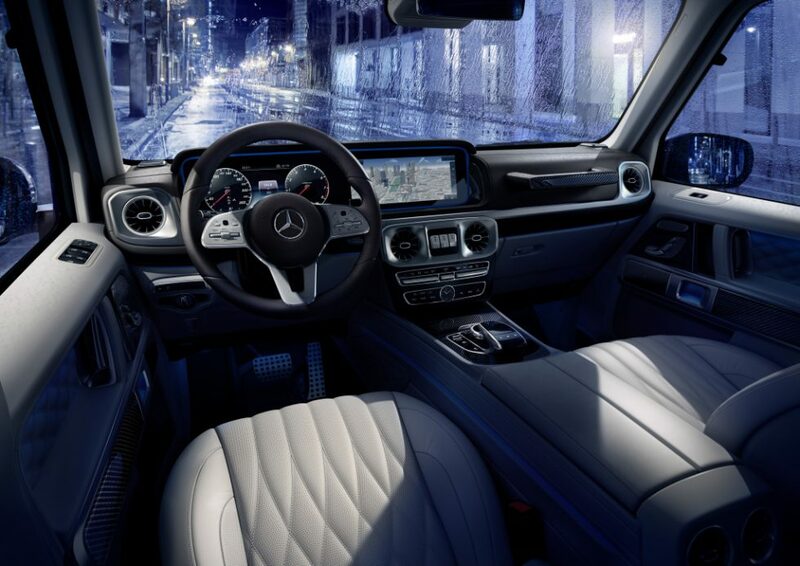 Mercedes-Benz makes living environments come alive with powerful images that radiate self-confidence and sovereignty. Thus, intense, metallic blue tones embody a modern and cool-puristic urbanity in the motifs of the “Blue Night” world of life. The impressions are enhanced by reflective lights of the evening city in a rainy night. Mercedes-Benz makes living environments come alive with strong images that radiate self-confidence and sovereignty. Thus, intense, metallic blue tones embody a modern and cool-puristic urbanity in the motifs of the “Blue Night” world of life. The impressions are enhanced by reflective lights of the evening city in a rainy night. 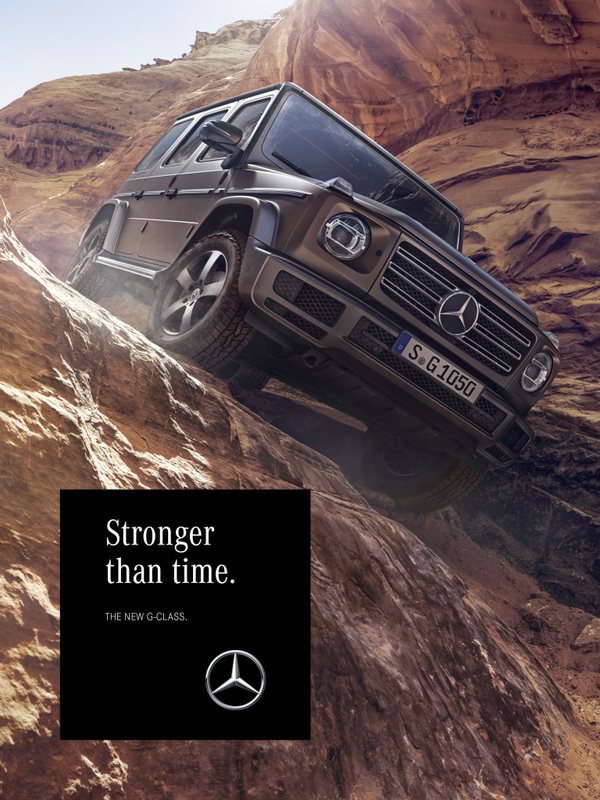 At the center of the digitally dominated campaign with its central hub at https://www.mercedes-benz.com/strongerthantime you will find three lifestyles: “Amber Rock”, “Green Lava” and “Blue Night”. With 35 campaign motifs and a 2:45‑minute video with three cut-offs, Mercedes-Benz showcases the lifestyles with powerful images, radiating self-assurance and supreme mastery. Rich, metallic blue tones embody a modern, cool purist urbanity in the motifs of the “Blue Night” lifestyle. These impressions are intensified by the reflected lights of the city at dusk on a rainy night. Mercedes-Benz accompanied the world premiere of the new G-Class on 14 January 2018 at the North American International Auto Show (NAIAS) in Detroit with the world’s largest installation in synthetic resin. 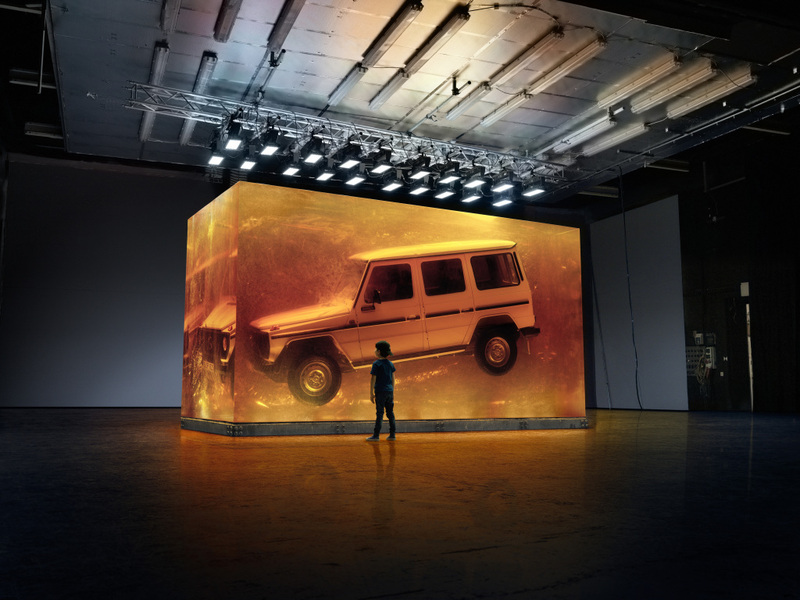 An amber-coloured block of synthetic resin weighing 44.4 tonnes encloses a G‑Class from the first year of production, 1979 – as an expressive image of the off-road legend’s timelessness. The presentation establishes an association with insects preserved in amber. 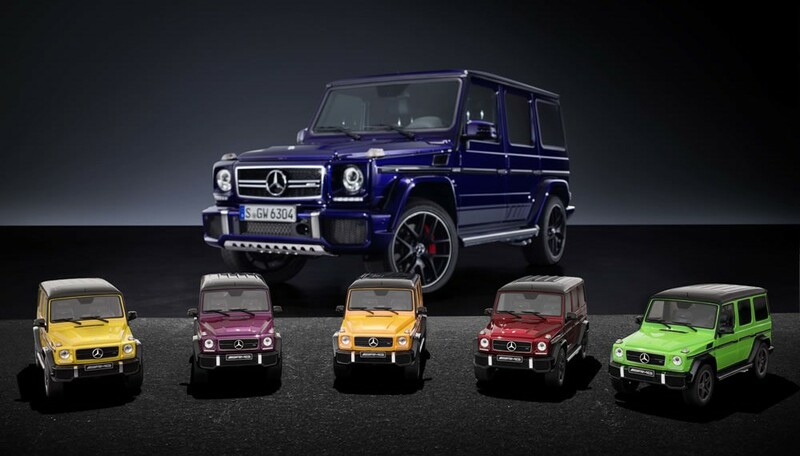 The DNA of the first G‑Class is permanently preserved this way and passed on from generation to generation. Following the Detroit Motor Show, the block will also be on show in other markets to tie in with the G‑Class market launch. Since November 2017 people all over the world have been able to discover the uniqueness of the G-Class on social media platforms and at https://www.mercedes-benz.com/strongerthantime. Under the hashtag #strongerthantime you can become part of the campaign yourself. 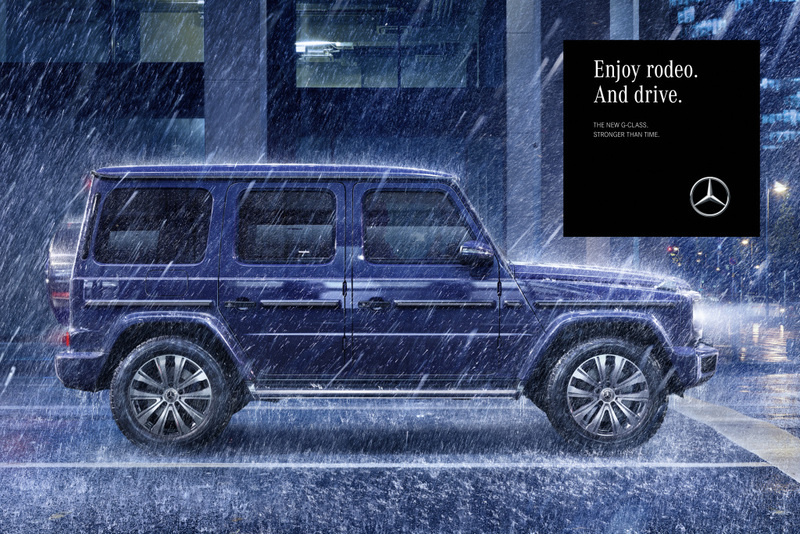 Selected stories are told in the web special “Stronger Than Time”, which is embedded in the G‑Class portal. The “DNA of the G‑Class” feature provides interesting facts from around 40 years of the G‑Class. 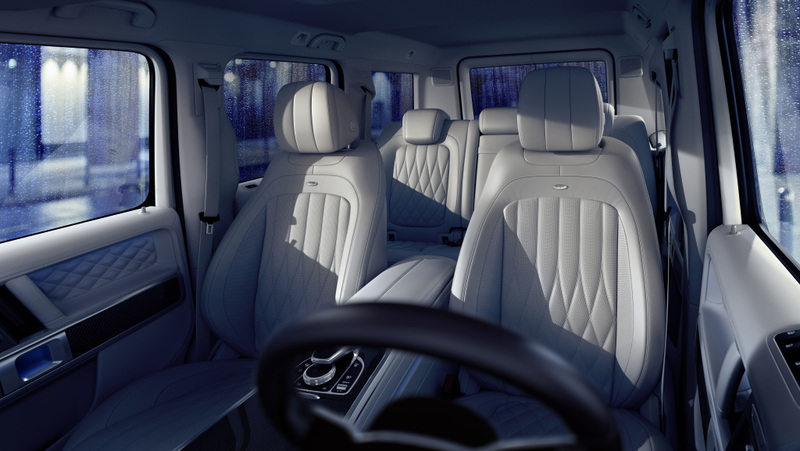 Under “The new G‑Class” you can experience the new G in all its facets. The column informs about the improved off-road and onroad performance as well as the timeless design of the all-terrain vehicle. The chapter “Strong Stories” tells the unique and varied stories of the old and new G‑C lass. The 45-second trailer for the publicity campaign has been available on social media platforms since early January: https://youtu.be/QtkhrTeh1Sg. In impressive images, underscored by dramatic music, the video shows how the G‑C lass has kept its unique DNA intact over generations. This is how a timeless vehicle evolved from it to become a legend over the years. In the official campaign video, which can also be seen on social media channels at https://www.youtube.com/watch?v=7iGFH5HbWGM, the different lifeworlds are focused on in individual image sequences. In the classic printed media the G-Class is to be shown in impressive images as of 15 January 2018. 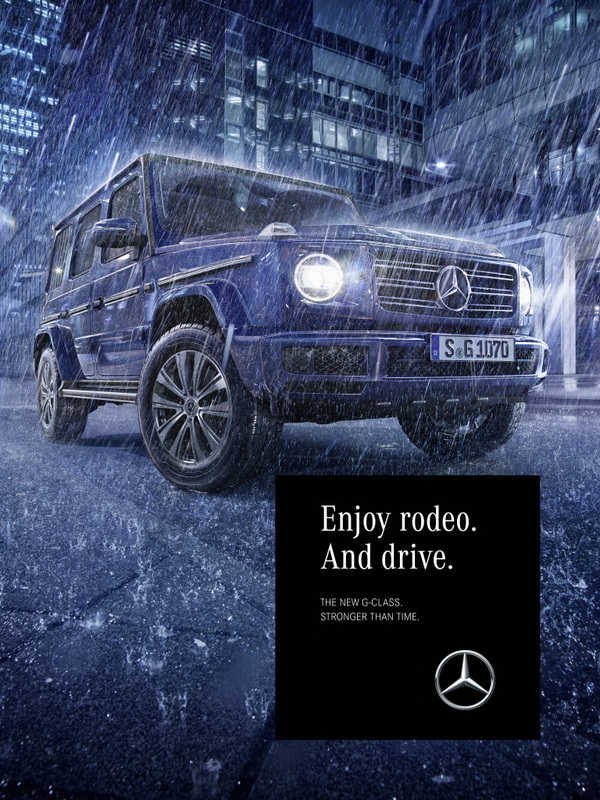 As in the online communication, the printed media campaign with its varied imagery shows that the G‑Class is an icon for more than one life world. 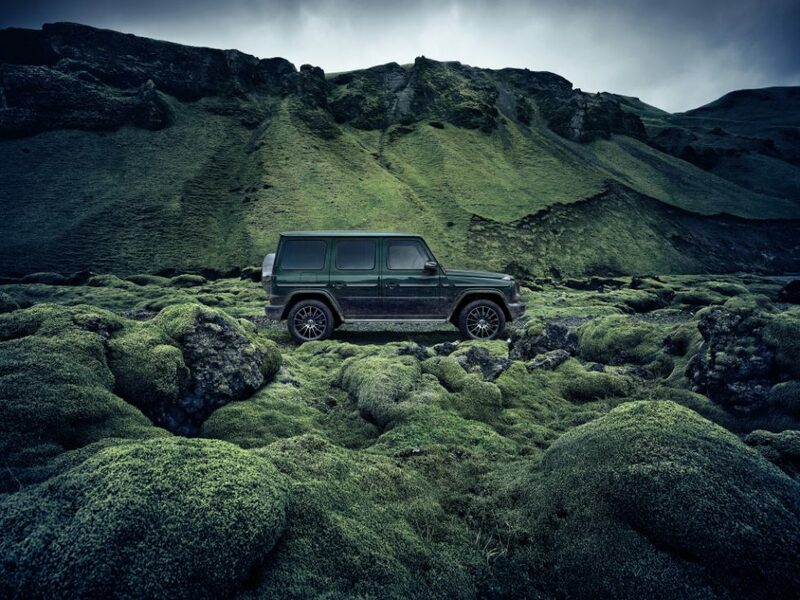 “Amber Rock”, “Green Lava” and “Blue Night”: the imagery relating to off-road capability, design and onroad performance incorporates natural elements such as rock and lava formations, as well as water which – like the G‑Class – are “stronger than time”. The tonality of the campaign reflects the character of the off-road legend: powerful messages in impressive visual worlds. The idea and conception of the campaign is from Mercedes-Benz creative agency antoni. The elbkind agency was responsible for implementing the social media campaign. 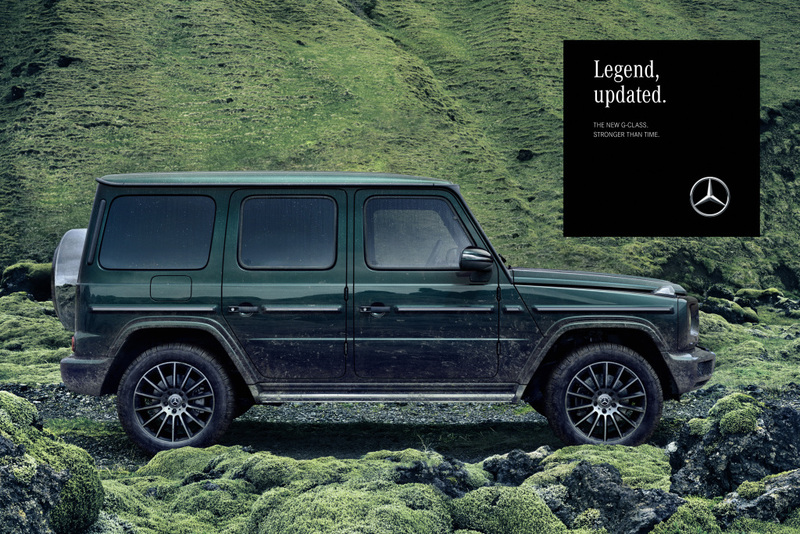 Like the online communication, the print campaign with its different image worlds shows that the G-Class is an icon for more than just one lifeworld. Thus, intense, metallic blue tones embody a modern and cool-puristic urbanity in the motifs of the "Blue Night" world of life. The impressions are enhanced by reflective lights of the evening city in a rainy night. 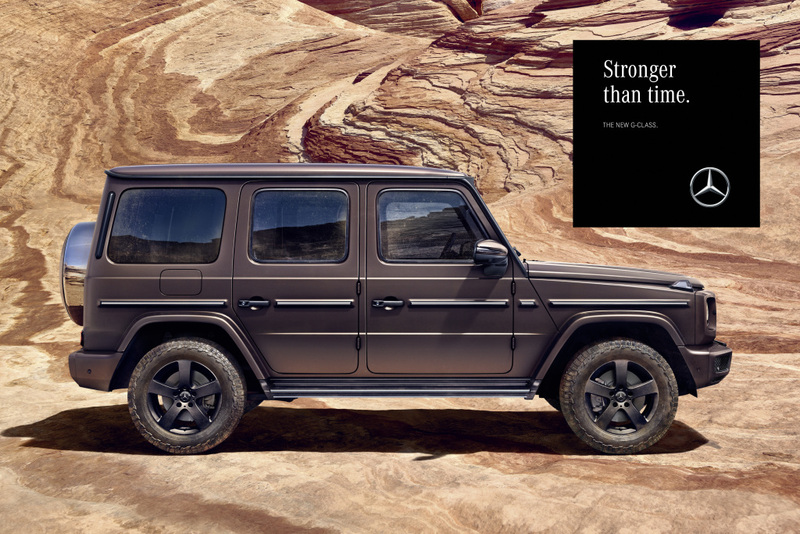 The campaign "Stronger Than Time" shows in a modern way the unmistakable DNA and timelessness of the G-Class. 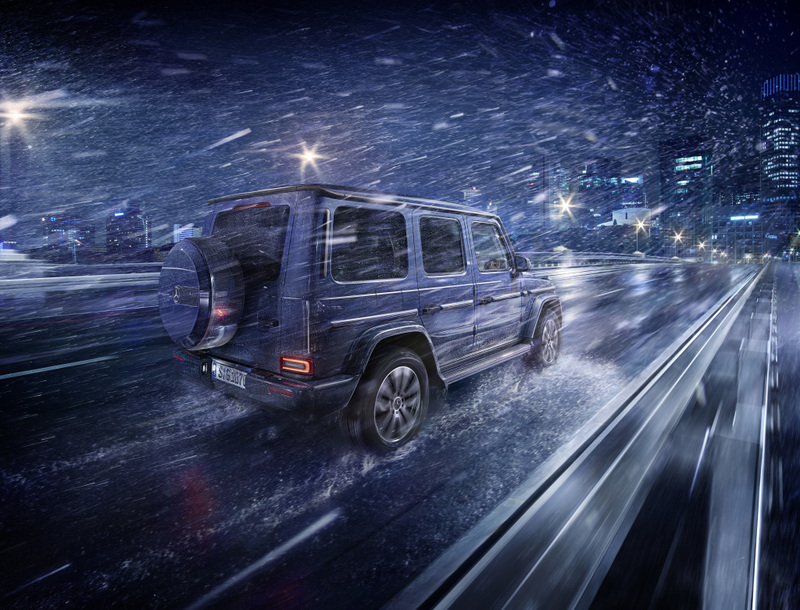 In classic print media, the G-Class will appear with impressive pictures from 15 January 2018. Image worlds of off-road capability, design and on-road performance, and take on natural elements such as rock and lava formations, and water, which are like the G-class "stronger than time". The tonality of the campaign reflects the character of the off-road legend: strong messages in impressive picture worlds. The global campaign "Stronger Than Time" starts on January 15, 2018 with the eponymous web special at www.mercedes-benz.com. In the field of campaign mechanics, it relies above all on digital media and social networks. "The iconic car is our oldest series and has developed from a pure off-road vehicle to an icon of the postmodern world of life. He is simply stronger than time and stands confidently over every fashion trend ", said Dr. Gunnar Güthenke, Head of Mercedes-Benz Product Division G-Wagon. The global campaign "Stronger Than Time" is accompanied by impressive motifs in the classic media. Impressive pictures and films show the product highlights of the new G-Class online and offline. Image worlds of off-road capability, design and on-road performance, and take on natural elements such as rock and lava formations, and water, which are like the G-class "stronger than time". In classic print media, the G-Class will appear with impressive picturesfrom 15 January 2018 . Here is an ad motif from the "Green Lava" world. 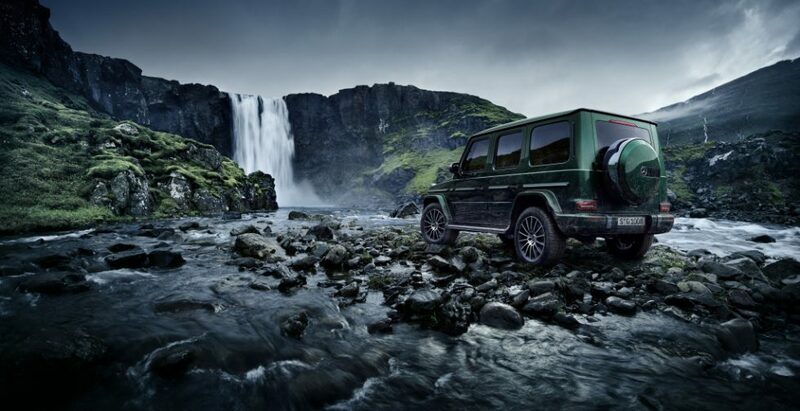 The themes off-road capability, design and on-road performance pick up natural elements, such as rock and lava formations, and water, which, like the G-Class, are "stronger than time". Here is an ad motif from the "Green Lava" world. With the campaign, Mercedes-Benz is taking customers and fans to the fascinating worlds of the iconic all-terrain vehicle and showing why the G-Class has thrilled people for almost 40 years. Here is an ad motif from the "Amber Rock" lifeworld. The tonality of the campaign reflects the character of the off-road legends: strong messages in impressive visual worlds. Here is an ad motif from the "Amber Rock" world. Mercedes-Benz makes living environments come alive with powerful images that radiate self-confidence and sovereignty. Thus, intense, metallic blue tones embody a modern and cool-puristic urbanity in the motifs of the "Blue Night" world of life. The impressions are enhanced by reflective lights of the evening city in a rainy night. Mercedes-Benz makes living environments come alive with strong images that radiate self-confidence and sovereignty. Thus, intense, metallic blue tones embody a modern and cool-puristic urbanity in the motifs of the "Blue Night" world of life. The impressions are enhanced by reflective lights of the evening city in a rainy night.